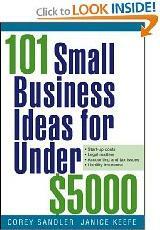 This book offers practical, real-world advice for turning ideas and skills into a successful small business. It presents great ideas for simple small businesses that readers can undertake either full-time or in their spare time and covers all the issues readers need to know - startup costs, legal issues, accounting, taxes, and everything else. This book offers practical, real-world advice for turning ideas and skills into a successful small business. It presents great ideas for simple small businesses that readers can undertake either full-time or in their spare time and covers all the issues readers need to know - startup costs, legal issues, accounting, taxes, and everything else. Once readers decide what business is right for them, the authors provide sensible business plans for making it happen. They show prospective entrepreneurs how to get started, find funding, and build a sales and marketing program. Legal, zoning, and insurance requirements are provided for each business idea, as well as advice on expanding the business - and the profits. Future business owners who don't know where to start will find everything they need here. Becoming your own boss is easier (and cheaper) than you think! It's time to grab yourself a piece of the American Dream. In 101 Small Business Ideas for Under $5000, you'll find realistic guidance for turning your ideas and skills into a profitable business that you can run full-time, part-time, or even as an absentee owner. This completely practical handbook provides step-by-step instructions on dealing with legal, financial, and tax issues involved in starting a business, and it puts you in touch with suppliers, associations, and clubs that can help you get up and running in a jiffy. Whether you want to provide home or professional services, organize entertainment and special events, start a Web-based company, go into light manufacturing, or profit from any talent or interest you have, 101 Small Business Ideas for Under $5000 puts you on the road to success—starting right now!